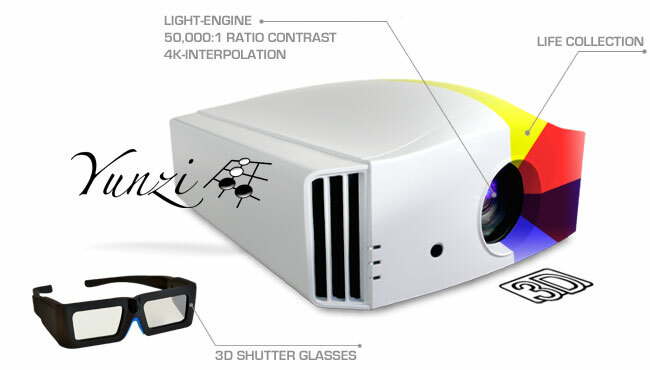 DreamVision has launched 3 projectors in 201: yunzi1 3d projector, yunzi2 and yunzi3. Though technically Yunzi refers only to sintered stones made of “yunzi” material (the exact composition is a secret), the term can also sometimes connotate stones which are single-convex of any material. DreamVision makes LCoS technology and DLP technology projectors. yunzi1 has 3-chip LCOS 0.7 inch panel – Full-HD 1920×1080 Resolution. It can give a screen size of 60” – 260” diagonal. 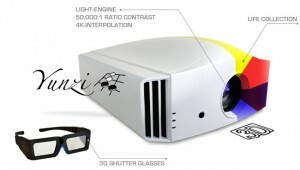 yunzi1 projector new model has 230 W Bulb with a life of up to 4000 hours (with lamp set to Low mode). Brightness offered is 1200 ansi lumens. It has a constrast ratio of 50 000:1. Yunzi1 has 2x HDMI rev 1.4a inputs and also 1x Component (3 RCA). Active shutter glasses are optional.